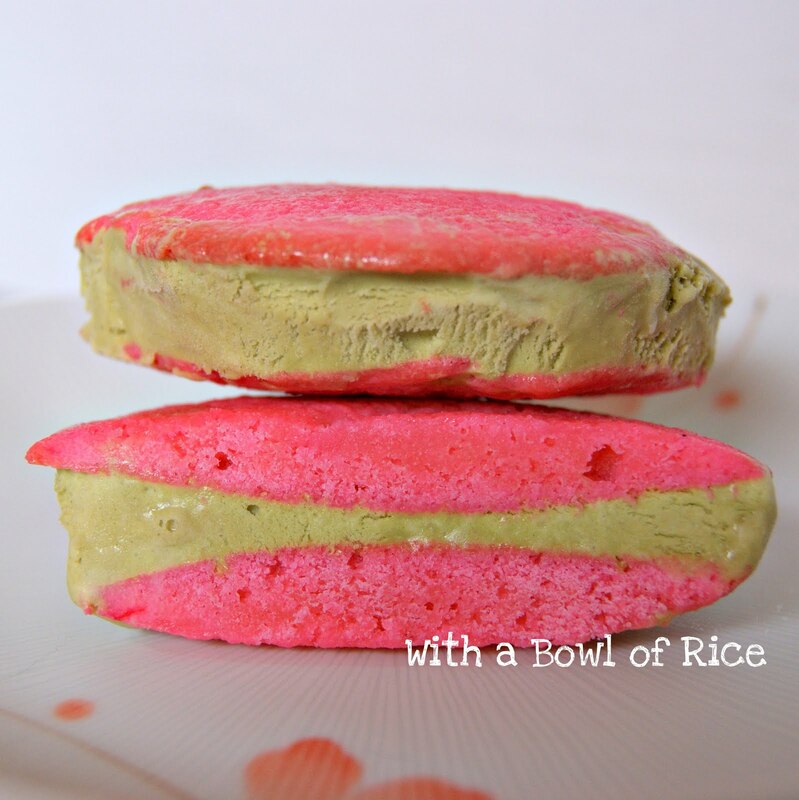 ← Samu’s Cookies, "It’s Not Yummy, but They Look Pretty"
So this creation, green tea ice cream sandwich, was the result of numerous trial and error. To my 4-yr-old, it was. He wanted instant success but of course sometimes life doesn’t work that way. I already knew from the get go, that this pink cookies will taste funky. He didn’t believe me. Now he does. But he still thinks it tastes good with the green tea ice cream sandwiched between the cookies. It does taste good that way. 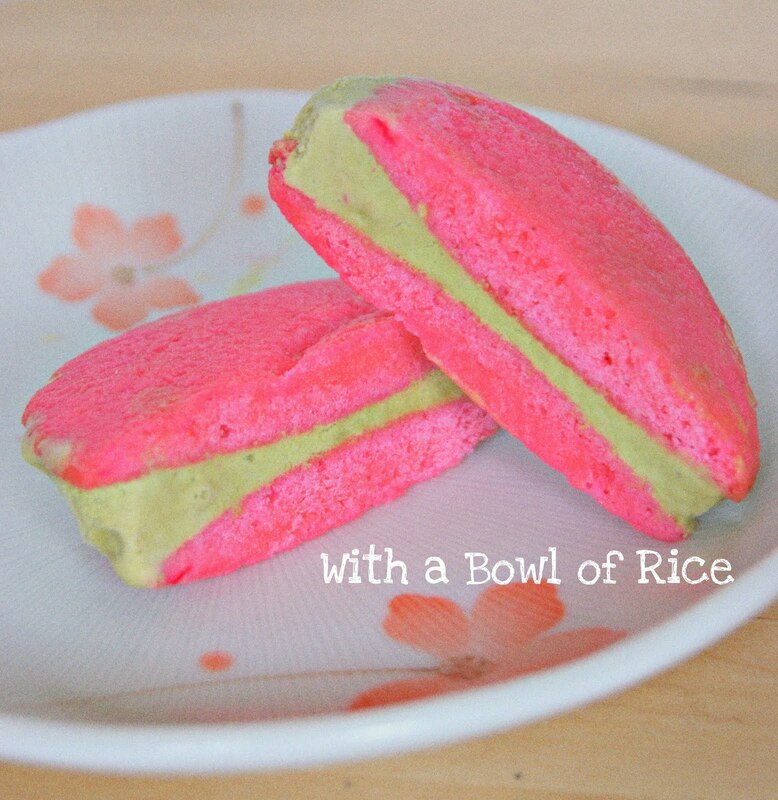 The pink cookie is fragrant with a hint of rosey flavor. Soft but still firm to the bite. Then bite deeper, you get the creamy green tea ice cream. My initial prediction was, the fragrant rose paste and fragrant green tea wouldn’t work. After all, you put two strong flavors together, they will be overbearing (at least that’s what my common sense told me). I was wrong! The two flavors actually complimented each other so well. Like Mr. Darcy and Elizabeth Bennett. This entry was posted in Baked goods, Cookies, holidays, Ice cream, In my kitchen, Sweets, Uncategorized. Bookmark the permalink. It's just way too cute! The cookies look so darling, the colors are lovely together (even for someone who doesn't like pink – c'est moi ;)) Can only imagine the fab flavors. I chuckled at the PP reference, haha!